Nanotechnology is one of the most promising fields for producing new applications in nanotechnology, biotechnology, and medicine. However, only a few products have been used for nanotechnology, biotechnology, and medical purposes. Nanoparticles have been among the most usually applied nanomaterial in our health care system for hundreds of years. The most prominent nano product is nano silver which generally present at 1–100 nm in size in at least one dimension. Silver nanoparticles reveal remarkably unusual chemical, physical and biological properties and have been used for many different applications which detailed in this review. 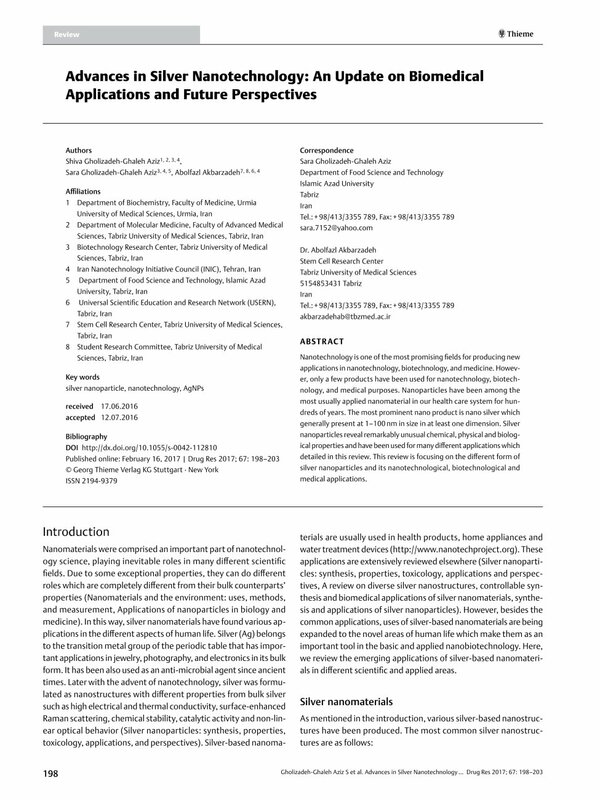 This review is focusing on the different form of silver nanoparticles and its nanotechnological, biotechnological and medical applications.